Months ago Kim reached out to several people who live and work throughout this area and one such contact was an archeologist, Jack Johnson. Kim is the master of coordinating. The first thing we added to our agenda today was a quick meet up to get our fix of archaeology. Jack works for the Park Service in Amistad National Recreation Area. Conversation sparked immediately over the history here. The Amistad Dam was built after a disastrous hurricane in 1954 caused massive flooding along the Rio and heavy infrastructural damage to the region. 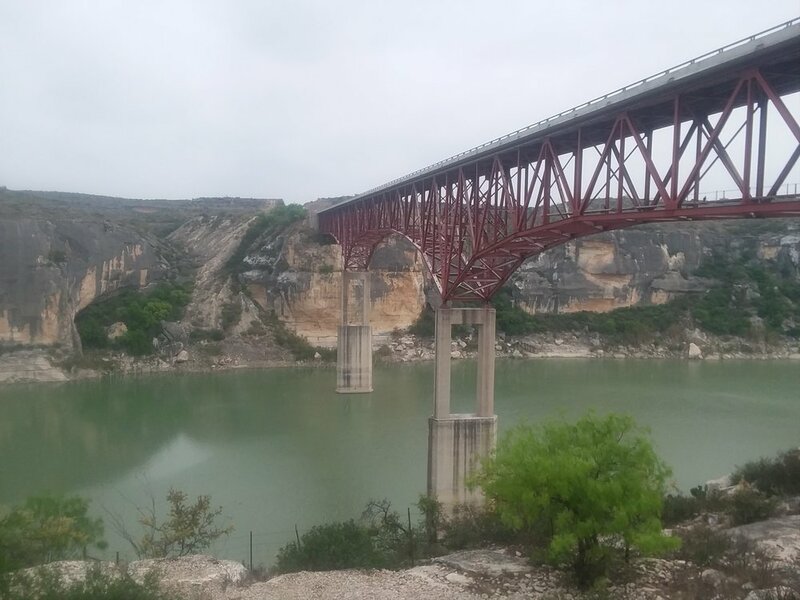 It is controlled by the International Boundary and Water Commission and forms the Amistad Reservoir, a popular recreational area. Jack reminded us that we’re leaving the Chihuahuan Desert, which we've been in since eastern AZ, and entering a new ecoregion. Here two different regions meet, the grasslands and the brushlands. Depending on different land management practices the region tends more towards grass or scrub. Currently they’re looking at scrub due to 150 years of overgrazing. Jack also told us that this particular area was rich in rock art and other archeological treasures. Seminole Canyon in particular is known for its pictographs. There is still a lot we don’t know about the region’s earliest inhabitants but Jack’s focus is on the hunter-gatherers that lived here. His work for the Park Service includes assessing archaeological sites for burn severity after a fire. Or he works on remaining survey areas that haven't been studied yet. We enjoyed hearing about his findings and some of the methods used by native peoples. One of our favorite cacti, the prickly pear, was used to line fires as an insulator so food wouldn't burn to a crisp. As we have reason to know, it’s a very sturdy plant. Jack also told us about the Black Seminoles, who are historically notable in this area and the namesake of Seminole Canyon. During slavery, many free blacks and runaway slaves escaped to Florida, controlled at the time by Spain which did not allow slavery. The maroons (as they were called) intermingled with the native Seminole people, forming their own distinct group known as the Black Seminoles. Forced to relocate by both Andrew Jackson and the threat of enslavement once the US acquired Florida, many of the Black Seminoles ended up along the Texas US/Mexico border. These guys were seriously skilled and served the US army as scouts during the Texas-Indian wars. A total of four scouts received the Medal of Honor for their services, making the Black Seminole scouts the highest decorated unit in US history according to Jack. However, none of the scouts ever received any of the land they were promised and were kicked out following their disbandment. Is that enough history for ya? We could have listened to Jack forever. He is clearly passionate about his work and extremely well-informed. He had a great quote he shared with us about what got him into archeology, but we forgot to write it down. Jack, can you remind us!? Unfortunately, we had to get hiking (and we had monopolized him too long). We only walked for a few hours, impatient to meet up with Fred, Kim, and Sarah. We were definitely feeling the strain of almost an entire month of hiking without a break. Man is it time for some dedicated hotel lounging! We found the parents at the Pecos River, another designated “Wild and Scenic” waterway that flows into the Rio. There was a gorgeous old suspension bridge that still spans the river, although the highway follows a more sensible concrete pathway. We poked around for a bit and then agreed we were satisfied with our measly 8 miles. Back to Del Rio. We found a cool little restaurant papered with old pictures of the family that runs it. It was Fred and Kim’s last night and we wanted to celebrate. On the way out, amidst some alcohol-induced laughter, we noticed a poster advertising an upcoming dance featuring the “Bunny Hop”, a ridiculously stupid 1950s dance move that the longer-lived members of our group delighted in demonstrating. The rest of the evening was spent trying to outdo each other with homemade dance videos featuring whatever retro steps the internet could provide.